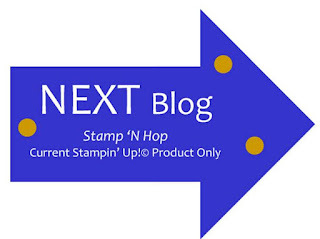 Hello and welcome to another Stamp 'N' Hop blog hop! We are a group of crafters from around the world who love to share our love of stamping and creating. If you are joining the hop from Pia or starting here with me, thanks for joining us - I hope you find lots of inspiration as you hop around with us this month. This month our theme is 'girls'. I chose to follow this theme literally with a stamp set I have not used for ages called Beautiful You! I was out and about at the weekend looking at cushions of all things - I was particularly drawn to several in yellow and grey which must have influenced my colour choice for this project! 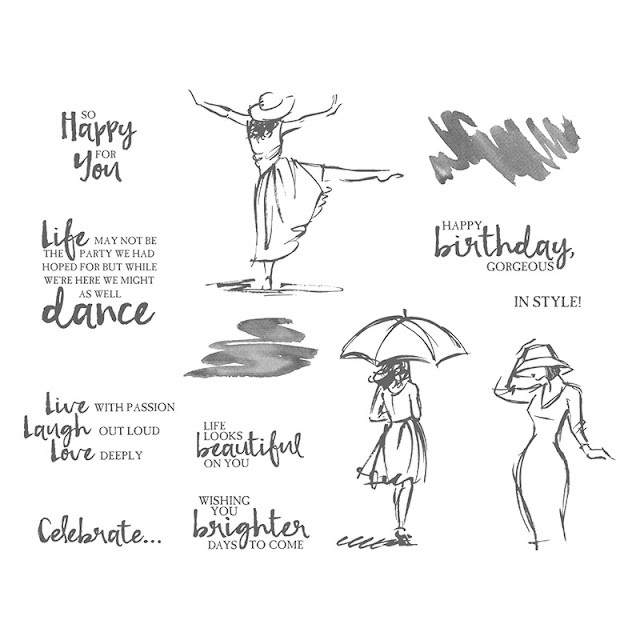 There are three lovely 'girls' in this stamp set and the sentiments are useful for so many occasions. 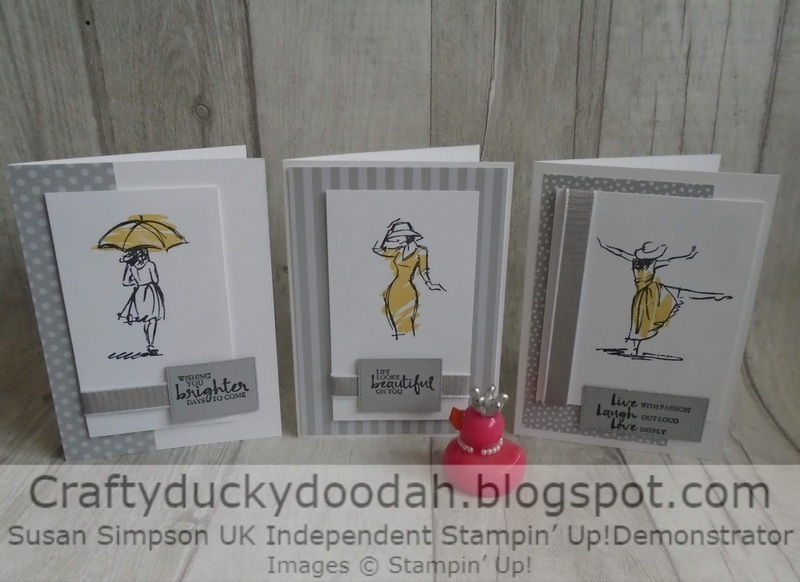 I particularly like the artistic feel of this stamp set and the colour wash images are perfect for adding a splash of colour. I used a couple of sheets of DSP from the 6 x 6 Neutrals paper pack. Stampin' Up! don't currently offer any Smoky Slate ribbon or trim so I used this lovely Grey Granite ribbon instead. Of course I used my most favourite dies - the Rectangle Stitched Shape Framelits (again)!! The ribbon on the edge of the stamped panel has been carefully placed to hide a splodge of yellow ink - no idea how it got there! The lady above is my favourite - for some reason she reminds me of my Grandmother who was a very elegant lady. Here are all my my trio of girls all together. I had these on display during my Coffee & Card session on Monday - my crafty ladies loved these cards; I will be offering these projects as a Workshop as soon as I can sort out dates. I think they call this pester power!! Next up is Laura - I can't wait to see how she interpreted our theme this month! I hope you have enjoyed my project; I always enjoy reading what you think of my projects and I would love you to leave a comment below. If you would like copies of any of the current catalogues let me know and I will pop them in the post for you. If you prefer, you can view online versions by clicking the links to the right of this post. What a lovely set of cards Susan. I am loving your colours. Thanks for hopping along with us & for sharing. Thanks Vicky, it just goes to show that inspiration is all around us!